Enjoy that first-class feeling on your travels, with the highest-specification ‘fully-loaded’ Tiger 1200 XRT. 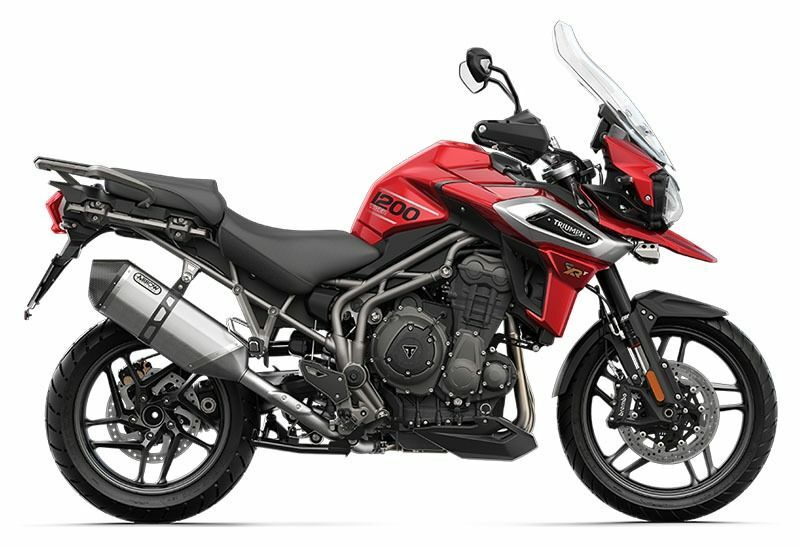 This is a motorcycle that's packed with more power, advanced ergonomics, contemporary style and the absolute highest level of state-of-the-art technology ever on a Tiger XR, all to deliver the ultimate road-focused adventure. In terms of exciting additional features, the XRT stands above all others in the XR range, adding to its existing specification with; adaptive cornering lighting, Triumph Shift Assist, LED lighting, titanium and carbon fiber-wrapped Arrow silencer, five riding modes to tailor your ride, hill hold, heated grips and seats, and an electrically adjustable touring screen. LIGHTER BY 24 LBS: An amazing 24 pounds lighter than its predecessor, transforming its handling and maneuverability, and achieved through over 100 enhancements across the whole motorcycle including a lighter flywheel, crankshaft, exhaust silencer, and battery. MORE POWERFUL AND RESPONSIVE ENGINE: The new generation Tiger 1200 XRT engine delivers more peak power (139 HP at 9,350rpm) and maximum torque of 90 FT-lbs (at 7,600rpm), for more immediate power delivery and even better all day, smooth reliable riding. NEW PREMIUM ARROW EXHAUST: A new premium Arrow silencer reflects the XRT’s top of the range status and delivers an even more thrilling Tiger Triple soundtrack. TECHNOLOGY SET-UP UNIQUE TO THE XRT: The highest spec road-focused Tiger 1200 has advanced features including adaptive cornering lighting, five riding modes, Triumph Shift Assist, LED fog lights, heated rider and pillion seats, a touring screen and hill hold. RIDING MODES: The XRT has five riding modes, enhancing control for every riding environment. With 'Rain', 'Road', ‘Off-Road’, 'Sport' and 'Rider Programmable’ modes, the new XRT is ready for anything. NEW WHEELS AND HIGH QUALITY TIRES: Significantly enhanced specifications for better all-round capability, the XRT has new stylish black aluminum cast wheels fitted with Metzeler Tourance tubeless tires (front R19 x 3", rear R17 x 4.5"). ADJUSTABLE SEAT HEIGHT: The Tiger 1200 XRT features an adjustable ‘2 position’ seat mechanism allowing the rider to lower seat height by .78 inches from 33.6 inches to 32.8 inches to suit their style and provide a more comfortable riding experience. 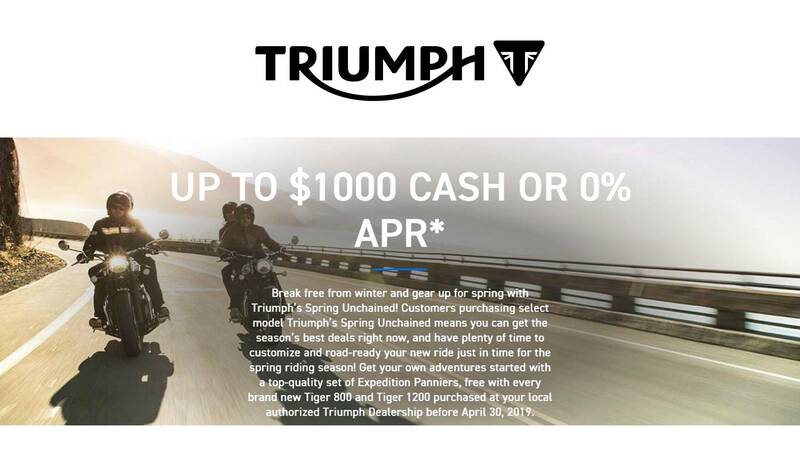 HIGH SPECIFICATION SUSPENSION:The XRT premium adjustable WP suspension is delivered by the Triumph Semi Active Suspension (TSAS) system which allows the rider to set a level of electronic control over how the bike reacts to the ride.